Having emergency fuel sources on hand can be a life saver. Here are the top six fuel sources to consider with emergency planning. In our everyday lives we are dependent on fuel to maintain our comfortable lifestyles. During a disaster however, we are even more dependent on fuel to maintain our basic survival needs. Having an emergency supply of fuel can help create warmth in your home to assist in regulating your body temperature, assist in cooking food, and also helps in powering essential emergency tools such as generators, household appliances. Storing fuel can also be very economical given the price increases we have seen in gasoline these days. Ensure that you have purchased proper fuel storage containers or tanks for safety. Further, investing in fuel stabilizers such as Sta-bil and Pri-G or Pri-D would be beneficial if you plan on longer-term fuel storage. Some preppers store the same fuel for all of their prep items and have purchased kits to convert their equipment to one specific fuel source. More information about these conversion kits can easily be searched for online. However, storing fuel for short or long-term disasters is not without its own set of unique challenges. Storing fuel can create fire hazards if not stored properly, can be an OPSEC nightmare, and lets not forget that depending on where you live, storing large amounts of fuel can be illegal. Ensuring that you follow safety regulations for properly storing fuel, and knowing what the EPA and regulatory issues associated with storing fuel are will help you in your fuel storage preparedness. Contacting fuel dealers that are in your local area can also provide you with a host of useful information on this issue. Use a proper fuel container to store fuel in. For safety reasons store fuel in an isolated area. Do not store fuel near your home or near appliances such as water tanks. Do not store fuel near ammunition. Store fuel downwind from any homes or buildings. Store fuel in a cool, dark area away from any sunlight or high temperature fluctuations. Rotate your fuel supply regularly. Have a fire extinguisher on hand in the area where the fuel is stored. Check the storage containers or tanks regularly to ensure that the fuel is safely stored away and that there are not any signs of leaking. Knowing how much fuel to store is dependent largely on what you plan to use the fuel on during an emergency. If you wanted to only run a generator with gasoline to power your home and appliances during the day, plan on using 1-2 gallons of fuel per hour. In a 72-hour emergency where you are reliant on yourself to provide power, plan on needing at a minimum 48-gallons of fuel. When making fuel storage preparations, think about what types of fuels your emergency equipment will need, and prepare accordingly. 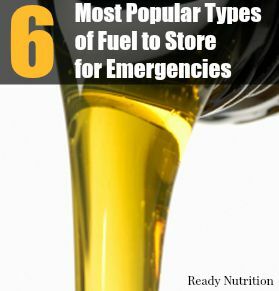 The six most popular fuel sources to store are listed below. Firewood – This is the most basic of fuel sources, is inexpensive and depending on where you live, there could be a plentiful supply for use. Many preppers believe that firewood is one of the greatest self-sufficiency advantages of off the grid living. Ensure that your firewood is seasoned at least six months and is kept dry. Firewood is also the only fuel that has re-usable bi-products. Firewood can be made into charcoal, and its ashes used in the garden or compost pile. Keep firewood off the ground and away from moisture will help keep the wood dry. Using a firewood rack and tarp would be very beneficials. Gasoline – Because of the oxygenate additives that are added to gasoline, it’s shelf life is greatly affected. The shelf life for gasoline is about 1 year if properly stored. This type of fuel will more than likely need a stabilizer such as Sta-bil added to it to preserve the gasoline. This fuel can be even more diminished if gasoline is subjected to heat, and moisture. Most cities prohibit this type of fuel from being stored above ground, so check with a fuel dealer in your area. Additionally, there is strong evidence that these fuels pose dire health and environmental consequences, so please follow the safety suggestions provided above. Two grades are available: #1 diesel which is old-fashioned yellow kerosene, and #2 diesel which is the same thing as #2 home heating oil. (You may see literature to the contrary, but #2 diesel is #2 heating oil. Period.) Diesel fuel presents its own unique storage problems: The first is that it is somewhat hygroscopic; that is, it will absorb moisture from the air.The second and related problem is sludge formation. Sludge is the result of anaerobic bacteria living in the trapped water and eating the sulfur in the fuel. Left untreated, the sludge will grow until it fills the entire tank, ruining the fuel. Stored diesel fuel should be treated with a biocide like methanol or diesel Sta-Bil as soon as it is delivered. Unique to #2 is the fact that some paraffin wax is dissolved in the fuel and will settle out at about 20° F, clogging the fuel filter. This “fuel freezing” may be eliminated by adding 10% gasoline or 20% kerosene to the diesel fuel. Commercial diesel fuel supplements are also available to solve the same problem. Diesel should be filtered before use. Kerosene – This is one of the more versatile fuels that can be stored for disasters for long-term use. Another perk of storing this fuel is it does not evaporate as readily as gasoline. Although some preppers add stabilizers to this fuel to ensure it remains viable, no special treatment is needed. Did you know that many pre-1950 farm tractor engines were designed to run on kerosene? In fact, diesels will run on kerosene if necessary. Kerosene stoves and refrigerators are also available and would be very beneficial to have on hand during a disaster situation, especially a longer-term disaster. Propane – Propane is a very popular fuel choice to store for disasters mainly because it is so widely available, easy to use, versatile and because it will last indefinately. Propane is widely used in “off-grid” areas as an alternative to natural gas and electricity, and it is also a good choice for emergency fuel storage. There some automobiles that are even run on this fuel source. Steel cylinders can be purchased is different sizes to contain the desired amount of fuel you will need. Solar power – Harnessing the sun’s power is another alternative to powering your home, and perhaps a new consideration for a preparedness plan is to look into solar preparedness supplies. There are a host of solar products that can make your life very convenient during an emergency. Consider doing some research on solar ovens, solar lamps, solar powered lights and lanterns, water heaters, well pumps and even farm equipment. When a disaster threatens, fuel is usually one of the first items people begin stocking up for, thus creating a shortage of supplies. If you plan ahead, and have multiple fuel sources on hand, you will be better prepared for surviving the disaster. Start researching what types of fuel you will need during an emergency, and how much you will need to survive a given emergency. Great post – most people never think about fuel. Kerosene – This is one of the more versatile fuels that can be stored for disasters for long-term use. Another perk of storing this fuel is it does not evaporate as readily as gasoline. Although some preppers add stabilizers to this fuel to ensure it remains viable, no special treatment is needed. Did you know that many pre-1950 farm tractor engines were designed to run on kerosene? In fact, diesels will run on kerosene if necessary…..
I’m confused: will my diesels run on kerosene? Does ‘kerosene’ require treatment like diesel (first paragraph) or not (second paragraph). Do you see the conflict? Most likely you should use a treatment additive in kero if used in a modern diesel engine, for added lubrication of your injection pump. Automatic transmission fluid would work for this. I would be so afraid of keeping fuel on this property, as there isn’t enough distance from the house, even at the back of our yard. So yes, if I have a bigger property I’ll probably be doing this. Where do you keep the fuel tank on your vehicle? Having lived in vans (sometimes down by the river?) since the mid 80’s, I have never had a problem with propane, using 5 gallon tanks to fuel heaters and stoves in 3 consecutive vans, including the current one for over four years. Hi Tess, Great article. III have gas saved up mostly for use in my motorcycle if need be. Research shows PRI-G and pri-d for diesel is better than stabil. It can also recondition old gas betterdid need be. I use it in my hurricane gas supply so its still good at the end of the season to put in my cars. My main fuel source is wood that I harvest from my trees when I trim them. I cut the one inch thick branches to about a foot long and store them in a 55 go drum after they dry. They can be used in my rocket stove or volcano stove as needed. I also keep a drum of charcoal too. Plant some trees if your don’t have any, or just a lonely pine tree at your house. Something that grows quick and you’ll have a ready supply real quick. For lighting I use homemade liquid paraffin candles that last for about ten hours without the kerosene smell or black soot. And be aware of fire dept. regs in your area. Here in suburbia those restrict one to a couple dozen gallons of gasoline – flout those restrictions and your insurance doesn’t have to pay a claim if there’s fire/explosion related to your fuel storage. Well, what other “Fuels” are there? Nuclear? Wind which isn’t mentioned and I don’t know why. All the other mentioned are no brainers. I use propane now as I live in the country. Suppl with wood in the winter. I have 240 gallons of 60 gallons drums left over from Y2K for gasoline storage. By the way anyone know where one can get gas wholesale or tax free? LOL !! I mean this article is what? Wake up and use your brain for about 10 seconds? I’ve used an alcohol stove for some time now using a wicking burner…that same burner can be used for any liquid fuel. Using alcohol is quite safe, can be put out with a wet towel. If you use 91% iso you also have a great antiseptic…dual usage! best of both worlds. A simple to make Garlington stove is the only thing I have available. I use twigs and for started melted candle with dryer lint to start. For those of you that cannot store fuel it is easy to make with a #10 can.